1 recipePastry for Double-Crust Pie (see http://www.bhg.com) – – I cheated simplified life and used 2 premade pie crusts from the freezer section of my grocery store. I did not use deep dish, just regular. 2 teaspoons finely shredded lemon peel or 1/2 teaspoon ground cinnamon – –I also made life easier here by using just a dash of real lemon juice instead of peel. I did use cinnamon also. Definitely didn’t measure, just shook a good amount in! Milk (optional) – – Yes! Love to make it look all sparkly with the milk and sprinkled sugar topping. 1. Prepare and roll out pastry for Double-Crust Pie. Line a 9-inch pie plate with half of the pastry. Or use your premade crust by just defrosting on the counter for about 1 hour. 2. In a large bowl combine the sugar and flour for desired berries, according to the amounts given below. Stir in berries and lemon peel or lemon juice or cinnamon. Gently toss berries until coated. (If using frozen fruit, let mixture stand for 45 minutes or until fruit is partially thawed, but still icy.) I let mine sit much longer about an hour to an hour and a half. 3. 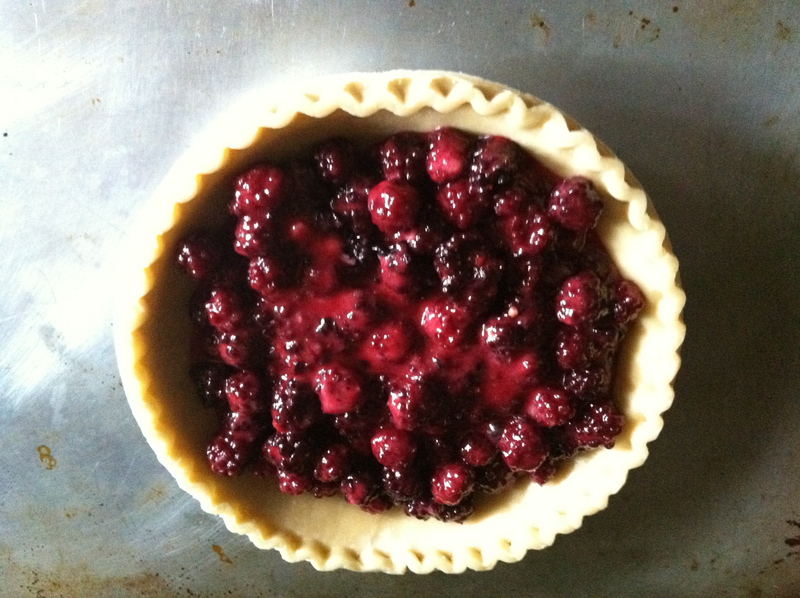 Transfer berry mixture to the pastry-lined pie plate. Your premade pie crust! Trim bottom pastry edge of pie plate. Cut slits in remaining pastry; place on filling and seal. Crimp edge as desired. After filling one of my premade pie crusts, I rolled out the other crust on a pastry sleve about 8 to 10 inches wide. Then, I cut into strips. Make sure to flour your surface and the rolling pin. 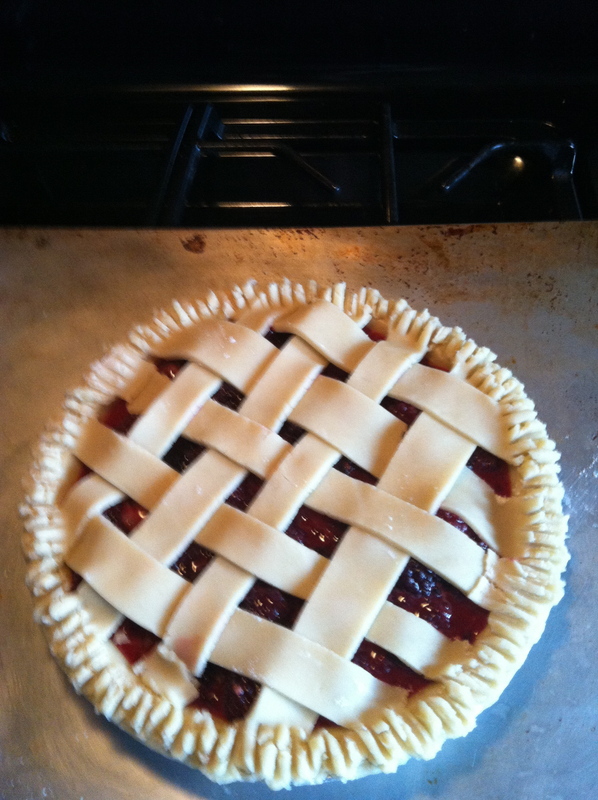 Place strip on pie and create a lattice pattern. See picture. 4. If desired, brush top crust with milk and sprinkle with additional sugar. I use a basing brush for this. To prevent overbrowning, cover edge of pie with foil. Bake in a 375 degree F oven for 25 minutes (or 50 minutes for frozen fruit). Remove foil. Bake pie for 25 to 30 minutes more or until filling is bubbly and top is golden. Cool on a wire rack. Makes 8 servings. See full recipe here along with nutrition facts. This entry was posted in Uncategorized and tagged Cooking, Pie, Quotes, recipe. Bookmark the permalink. It is such a blessing to see the love of a young family. You make my heart full of thanks that members of my family have such appreciation for each other.